IF WE DON'T PAY TAXES THEY WON'T WORK FOR FREE. "SO NO MORE TAXES AND PAYMENTS"
3.- DO NOT BUY IN BIG STORES. 4.- TO HELP POOREST PEOPLE BUYING IN SMALL STORES, MARKETS ETC. 5.- AVOID BUYING THINGS ANOUNCED ON T.V. SPOTS, NEVER LISTEN & NEVER WATCH SPOTS ON T.V. IF YOU CAN AVOID WATCHING T.V. 6.- DO NOT OBEY PEOPLE FROM THE OLD SYSTEM. 7.- NEVER GIVE MONEY TO THESE CRIMINALS WHEN THEY ASK FOR MONEY ON T.V. LIKE THE "TELETON" DONATIONS, DISASTERS ETC. IF YOU WANT TO HELP, DO IT IN PERSON. AND NEVER TO THE TELETON BECAUSE THE MONEY IS JUST FOR NEW DRUG CARTELS. END OF THE WORLD SYSTEM - 7 COMMANDMENTS from daly dal on Vimeo. 2.- BECAUSE OF THE SATANIC RITUALS & HUMAN SACRIFICES THEY PERFORM WITH THE MISSING PEOPLE & BECAUSE AFTER THE SACRIFICE THEY EAT THEM. 3.- BECAUSE HUMANS ARE ONLY TO BE USED BY THEM FOR DIFFERENT THINGS LIKE FOOD, EXPERIMENTS,MIND CONTROL,IMPLANTS,TARGETED INDIVIDUALS, VOICES TO SKULL,TO STEAL HUMANS ENERGY, BLOOD, ADN, SOUL,ETC. AND THEY DO THE SAME IN ANOTHER PLANETS ETC. THE ISLAND OR HUMAN FARM CALLED EARTH 2 from ASHTAR on Vimeo. 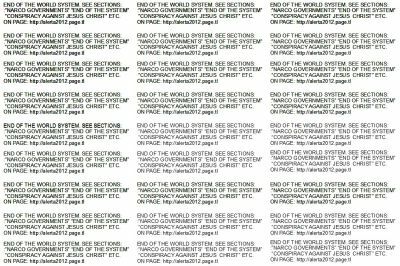 ALL THESE VIDEOS ARE ON SECTION: CONSPIRACY AGAINST JESUS CHRIST. 4.- BECAUSE UNFORTUNATELY THE PLANET IS STILL GOVERNED BY THESE POLITICIANS CANNIBALS AND BY EXTRATERRESTRIALS WORKING TOGETHER, THW WORST ALIENS ARE THE DRACONIANS OR REPTILIANS (SUPERIOR ANIMALS GOVERNING THE EARTH). DRACOS-CANIBALES - DRACONIANS CANNIBALS from daly dal on Vimeo. BECAUSE THEY MIND CONTROL PEOPLE WITH HAARP, ETC. from daly dal on Vimeo. TESTIMONIO DE RITUALES SATANICOS Y SACRIFICIOS HUMANOS DE TELEVISA 2 from daly dal on Vimeo. 7.- THE NARCO MEDIA WILL NEVER PUBLICATE THIS BECAUSE THEY ARE PART OF THE NARCO & CANNIBAL SYSTEM & & IT'S TO MANIPULATE & MIND CONTROL PEOPLE GET THEM SICK WITH THE SPOTS OR ADVERTISEMENTS. MOST OF THE BIG MEDIA BELONG TO THE SAME CRIMINALS. FOR ALL THESE & MUCH MORE LIKE THE DIFFERENT ATTACKS & CRIMES AGAINST HUMANITY AS YOU CAN SEE ON OUR PAGE, WE MUST FINISH WITH THE WORLD SYSTEM, FOR THAT REASON NEVER FORGET TO TAKE OUT THE LITTLE PAPERS EVERY TIME YOU PUT A STEP OUT OF YOUR HOUSE, & THANKS A LOT BEFOREHAND, TO HELP US & JOIN US.